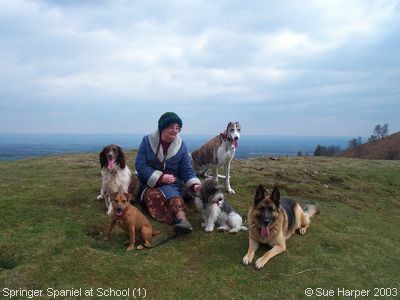 From time to time Poppy went for a refresher course to her dog trainer in Malvern, and she is photographed here taking a break from the “Cross Country”, with me and a few of her school chums! Left to right are Poppy, with long tongue hanging out; Toby in front, a Border Terror, erm Terrier...; Tigger at the back, a lurcher; Snoop(y) on the lead; and Caesar the German Shepherd, at front right. All delightful dogs! There is another photograph of them - with their teacher - below. 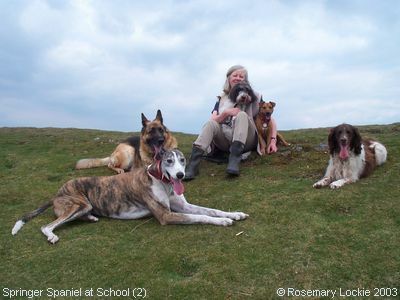 Here are a 'Class of 2003' with “Miss” from, the aptly named “Educating Rover” Academy, providing professional dog training of the very highest standard in the Malvern area. Left to right are Tigger in front, a lurcher; behind him is Caesar, a German Shepherd; Snoop and Toby, under her owner's wing; and on the right my Poppy. Don't they all look happy and contented at their class?